I have designed a very unique sailing hydrofoil and have built and tested a large model. 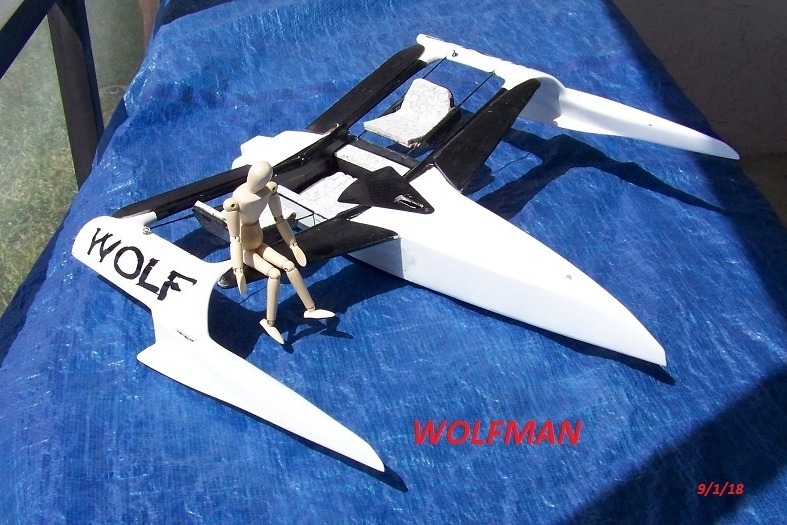 I want to build and test a fullsize prototype as Stage One of the WOLF Project that will eventually lead to the production of the boat. The boat utilizes a unique foil system and design that will allow flying in as little as 5 knots of wind. Its unique design will produce an easy to sail boat with great stability and a major emphasis on comfort. There has never been a sailing hydrofoil using the technology this boat does in its size range. I believe WOLF can open up foiling to a wider range of people than anything in existence due to its ease of handling(on and off the water), comfort, light air takeoff and stability. The main purpose of this Stage One portion of the Project is to prove beyond a shadow of a doubt that the Wolf Technology works and works well. That will open up a whole new way to sail for lots of people who might otherwise never experience foiling. It seems to me that the people who may share this vision of a new way to sail would like to help other people so I aim to do something about that by making an irrevocable promise to share the completed and tested prototype with a sailing school or a sailing related charity. This will occur once the boat is fully tested and developed which will happen approximately one year after the project is fully funded. It will be a mutually beneficial arrangement allowing WOLF Project Donors to experience the boat while at the same time contributing to the growth of a sailing school or charity and development of the WOLF with real world experience. But I need help to get this done! Don't hesitate to call or write with any questions.